Today more than 30,000 teachers are going on strike in Los Angeles. In several schools, there will be solidarity strike action from teaching assistants, custodians, fod service workers, bus drivers, and other unionized workers who provide essential support services in the school district. 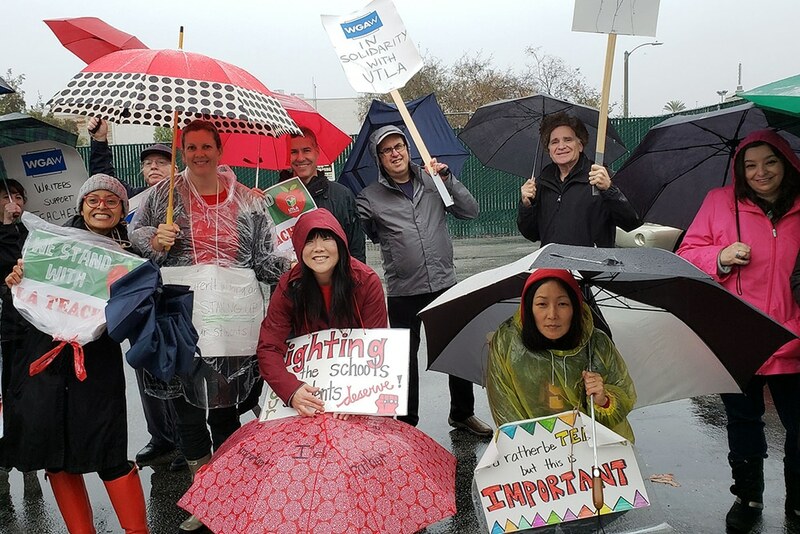 The Los Angeles strike comes in the wake of a series of teachers’ strikes in the United States, an extraordinary wave that began with the wildcat action of West Virginia teachers in February, 2018. The West Virginia strike was followed by Oklahoma, Arizona, Colorado, Kentucky, and North Carolina. For instance, how can accounting, in the neoliberal sense, be done of teachers performing multiple tasks beyond simply teaching in the classroom? Many L.A. Unified schools, about to go on strike, do not have a full-time nurse or librarian—the union is demanding one full-time librarian for every middle school and high school, and one full-time nurse for each school. Teachers frequently perform these additional tasks for the sake of their students whose welfare is foremost on their minds. Given this totalising nature of the crisis, “solutions” to the crisis in the Social Reproduction sector need to be solutions that are sensitive to the very category of social spending understood in the most expansive, and socialised way possible. Such solutions must include public investment in childcare and eldercare services for all, such that those who provide care for a payment, do not lack for these supports in their own homes. When I first met Rebecca Garelli who would become one of the leaders of the Arizona teachers’ strike, she strained to answer my questions while juggling three small children! In the United States, as in large parts of Global North, losing a job does not just mean the loss of an income, it also indicates loss of access to healthcare, disability insurance and several others social services—services that should never have been made conditional or tied to employment. Thus, social solutions must include non-contributory social transfers, available to anyone in need, as well as a robust system of social insurance through workplaces. Most importantly they must include labourregulations that guarantee decent wages and leave policies for all workers. While it is vital that investments be made in the sphere of social reproduction— more schools, more nurses, more social workers, more librarians— it is crucial that further investments be made in the broader arena of social reproduction to allow teachers, nurses and other care workers to do their job in effective as well as meaningful ways. ↩ See Natasha Ushomirsky and David Williams, Funding Gaps 2015: Too Many States Still Spend Less on Educating Students Who Need the Most, See Trust, 2015. ↩ See Kim Moody, On New Terrain: How Capital is Reshaping the Battleground of Class War, 2017, pp. 38-9. ↩ See “Public School Teacher Spending on Classroom Supplies”, National Center for Education Statistics Report, May 2018. Tithi Bhattacharya is a professor of history at Purdue University. She is the recent editor of Social Reproduction Theory: Remapping Class, Recentering Oppression, and along with Nancy Fraser and Cinzia Arruzza the co-author of Feminism for the 99% A Manifesto. She is a national organizer for the International Women’s Strike.